About Puerto Rico - CPM REALTY Humacao, Puerto Rico - The Caribbean Side. What to do? Joannes Est Nomen Ejus, Latin"John is his name". investigations and amendments, the current version was adopted in 1976. 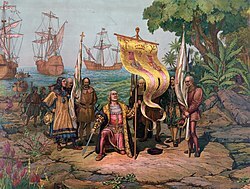 Christopher Columbus arriving in the New World carrying a banner with the initials ofFerdinand II and Isabella I.
government of Puerto Rico in 3 June 1976. The green background represents the island's vegetation. generally attributed to St. John the Apostle. of Sicily, and henceforth to the Spanish Crown. monarchs when Puerto Rico was discovered. used to represent Puerto Rico on its legal documents when they are sealed. Voltage : Voltage is the same as US mainland , 110-220 volts, 60 hz. Electric consumptions is very high in Puerto Rico. Liquor Laws: The legal drinking age is 18 - Municipal ordinance forbids alcohol consumption on the streets. Climate: Tropical average annual temperature is 82F (28 C) with constant mild easterly trade winds. Perfect weather year round. Driving: Driving is on the right side of the streed, US driver's license can be used for up to three months. Mail : USPS - All major courier/ such as UPS or Federal Express do service Puerto Rico. Come to Puerto Rico - and see why we are "The Enchanted Island"
Information is deemed correct by not guaranteed. What's not to like ? Home vs apartment living, these two lovely units are just some of the luxury homes and apartments we can offer you in the resort community of Palmas del Mar, Puerto Rico. Call us, and let us help you make the right move..